We have this superb new photograph of the all conquering Welsh 2008 Six Nations and Grand Slam winning team. 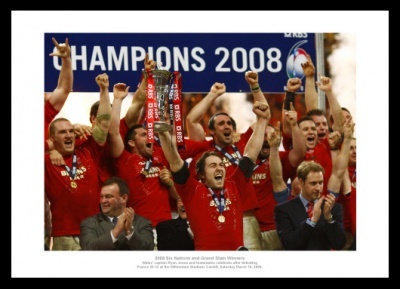 Wales' captain Ryan Jones and teammates celebrate winning the title after defeating France 29-12 at the Millennium Stadium, Cardiff, Saturday March 15, 2008. We can supply the image as photo only, framed in a black wooden frame, and on ready to hang, fade resisitant canvas.